Made-to-measure, fully automatic machines and systems from UTSCH make it possible to produce blanks and finished license plates reliably, economically and on a large scale with minimal staff. Fully automated production in large quantities. 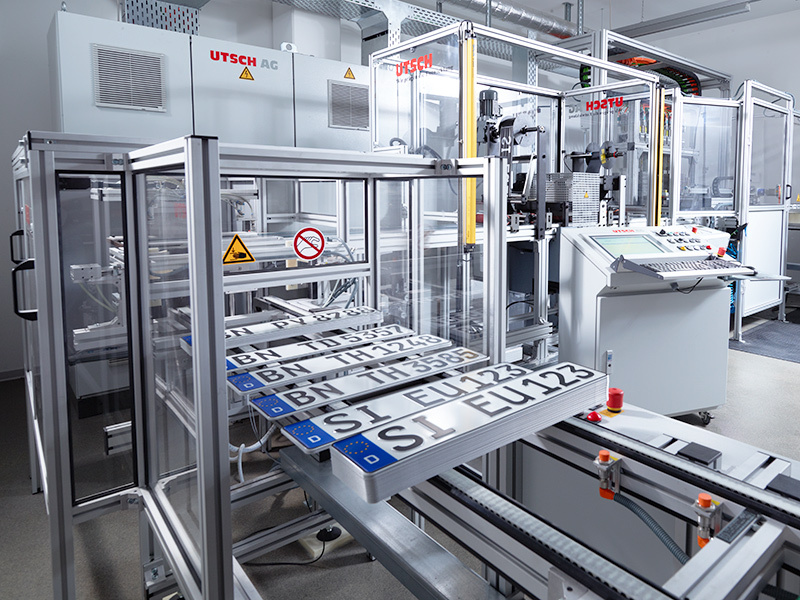 The Automatic Embossing Press (AEP) developed and patented by UTSCH enables the fully automated, computer-controlled production of vehicle license plates in large quantities. The previously entered type for pairs of plates is automatically processed by the system. In this way, a country's entire license plate requirements can be produced centrally, securely and precisely (with minimal personnel requirements) on made-to-measure, fully automated production systems. Up to 80 license plate blanks per minute can be manufactured on an UTSCH production line. Because the UTSCH production line is modular, the exact number depends on the number of production stations that the blanks pass through. The individual modules are linked up as production stations according to the customer's requirements for the blank characteristics. The minimum equipment in an UTSCH production line includes a decoiler and straightener (to unwind the aluminium strip from the coil and feed it in), a laminator (to apply the reflective film) and a punching machine (to cut out the blanks from the aluminium and emboss the edges). Various intermediate stations can also be incorporated to add extra finishes (e.g. holograms or laser engraving) or for additional reliability and convenience in production, for example a preheating oven for the aluminium strip, quality assurance or fully automatic destacking and packaging of the finished blanks. 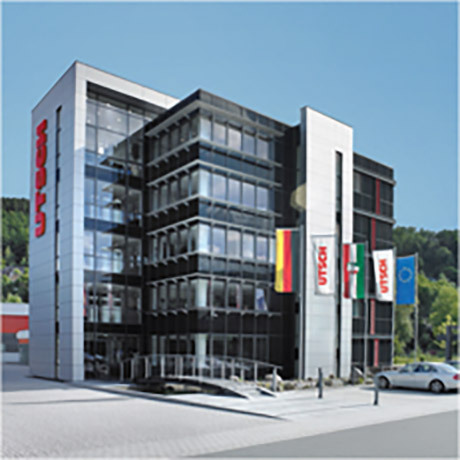 Every production line constructed by UTSCH is unique, reflecting the customer's individual requirements. 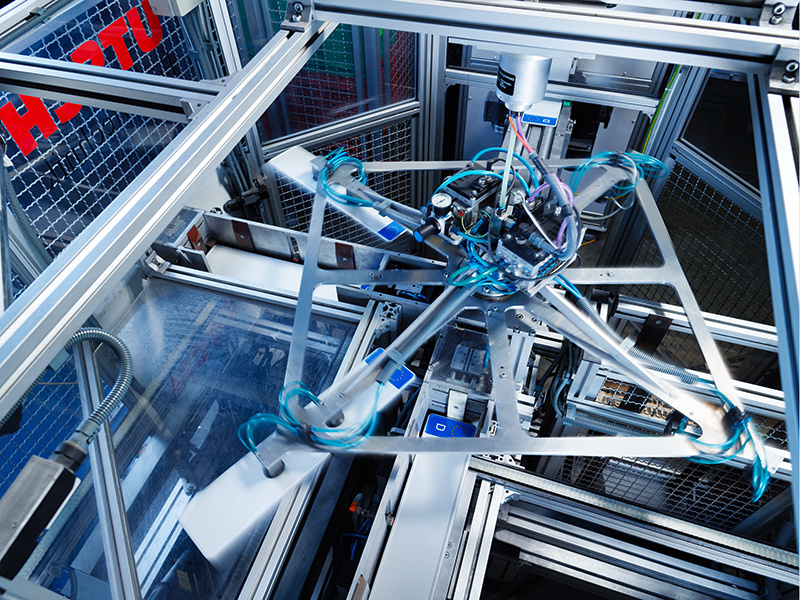 And it doesn't stop after the production line is started up: UTSCH offers proven, reliable remote maintenance and (where necessary) highly skilled on-site service to keep the production process running smoothly.